Address: 142200 Moskovskaya obl., Serpukhovskoy r-n, pos. Danky. 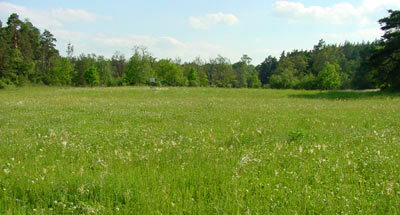 Zapovednik Prioksko-Terrasny, on the south of the Moscow Region, was established in 1945, its area is 4,9 thousand ha. The Zapovednik is located on the southern slope of the Oka River valley and includes floodplain terraces and some part of the watershed. About 92% of the area is woodland. Pine forests with lichen, pine forests with green moss, and those with herbs prevail. There also occur pine forests with some steppe species. Spruce-pine forests can be found. Linden-oak pine forests occur in the watershed; spruce forests, in the valleys of small rivers. Occasionally, broad-leaved forests – oak, linden and linden-oak forests remained. Half of the Zapovednik area is covered by derivative birch and aspen forests. Sphagnum bogs can be found. The meadow steppe site is of interest, with more than 50 species of southern plants, including the European feather grass, Fritillaria ruthenica, Scorzonera purpurea is referred to as the "Oka flora". The vegetation comprises over 800 species of higher plants, including rare (the military orchid). 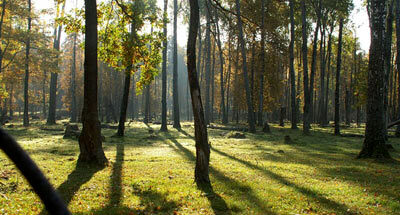 The wildlife is typical of central Russian Plain, with: moose, red deer, wild boar, red fox. Few in number are the marten, least weasel, badger; the wolf, lynx, European mink, and common otter occasionally appear. The roe deer has been transplanted, and the beaver re-acclimatized. The sika deer, and raccoon dog have been acclimatized. 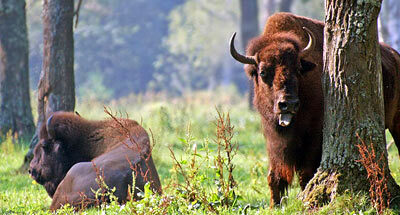 There is a European bison nursery. There are 100 avian species, Passeriformes prevailing. Other common species are the black grouse, capercaillie, hazel grouse, goshawk and sparrow hawk, black kite, kestrel, barred owl, little owl. There are some rare invertebrates: swallowtail, moth butterfly, etc. The Zapovednik has a biosphere status.